On a visit to the northern border, President Shimon Peres hears about the new security difficulties facing Israel from the north. 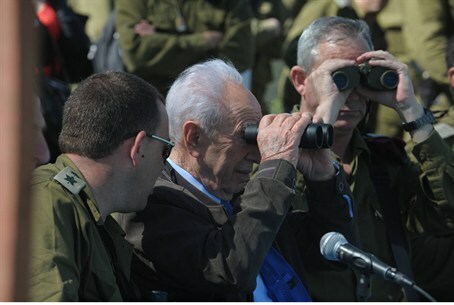 President Shimon Peres visited the northern border on Sunday, in a pre-Passover visit in which he met with top IDF officers in several parts of the country. On Sunday's visit, Peres met with Deputy IDF Chief of Staff Gadi Eisenkott and Northern Command head Yair Golan. The four soldiers were injured when an explosive device went off on the Golan Heights, as an IDF jeep was passing by on March 17. The incident occurred near the border with Syria, outside the village of Majdal a-Shams. The injured soldiers were being treated at Rambam Hospital in Haifa, where they were airlifted by helicopter. One of the soldiers was seriously injured, while the others sustained light injuries. “The northern border is undergoing a change because of the ongoing civil war in Syria,” said Golan. “We are witness to an increase in activity and strength by international Jihad groups, who are uniting with Muslim radicals. “As a result we have decided to set up a new division that will provide solutions to the new security situation,” he added.